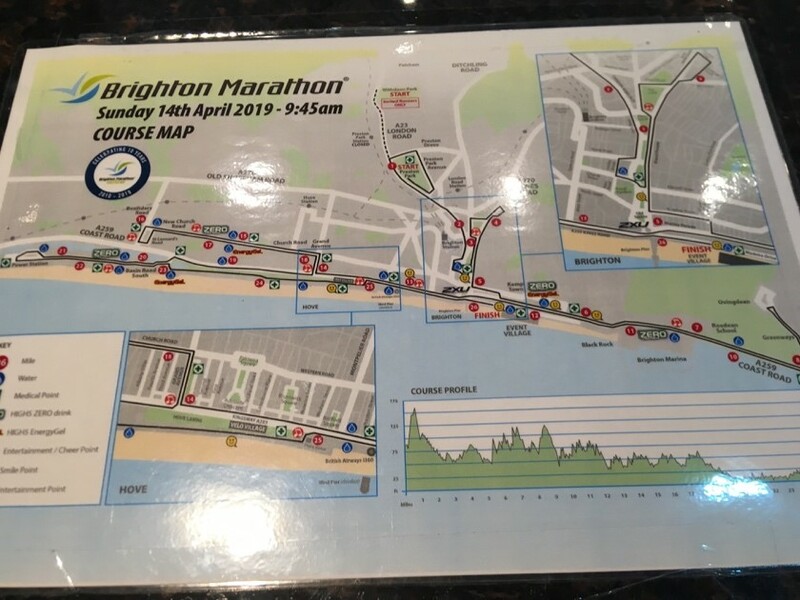 Last autumn two of my daughters decided to sign up for the Brighton marathon, so if you can’t beat them…. In January I looked at my diary and wondered when I would find time to do the training. So I thought I would just come along to support. In the meantime Victoria decided that studying medicine and marathon training were not compatible so bowed out. I managed to get some long runs in some of which were in awful weather – thanks to Nic and the Sunday crew for their support. So it was‘Carpe Diem,’ let’s just do it . The hotel I found was very convenient for the start and the finish. However it was within spitting distance of a nightclub which was not conducive for a good night’s sleep! There were plenty of runners in the hotel so breakfast at 7.00 am was quite busy and there was nearly a riot when we heard they did not serve porridge. Luckily we had brought our own. The start was in Preston Park about 30 minutes walk from the hotel. There were five corrals and we started in the second, even so it took several minutes to cross the line and it was rather congested in the first mile or so. The course was undulating and probably the worst hill was at the start. We did a loop then made our way to the coast. It was a good temperature for running but we were running into the wind so obviously I hoped that on the way back we would have the wind behind us. (which didn’t actually happen!). At about 7/8 miles the course was very open, the sea was on one side and fields on the other. It reminded me of the Nationals Cross Country Race when you could see nothing but runners in all directions, quite a spectacle. As there were various loops along the course you could often see runners either behind or in front. I got quite excited when I saw the 22 mile marker but then realised it was on the other side of the road and I had to do a loop to get to it! Although I am not a ‘techy’ runner I had various times in my head for the distances ; 25 mins for 5k, 50 10k etc. which actually went according to plan until nearer the end when the wheels came off. I’d rather not know how long it took me to run (if you could call it that!) 7k from 35k to the finish line. I felt like I was wading through treacle. It was very blustery along the final stretch but at least that part was flat. The organisation was fantastic , there was water in paper cups every mile and gels. The crowds were amazing, giving out sweets, orange segments and even dates. Like Manchester there is a part of the course which is less populated from 18-23 where you go around an industrial estate, not very interesting but quieter. I was happy to see the FINISH sign loom larger and larger as we finally turned off the coastal road. I managed to avoid the medical centre this time, although I was caught by one of the helpers as I crossed the line and needed help taking my shoes off to put more clothes on. It never ceases to amaze me how some people just stroll away from the finish line. I couldn’t keep up with my daughter as we made our way back to meet our supporters (Laura’s fiancé and a friend). After a slap up meal – as usual the supporters were hungrier than the runners – we made our way home. 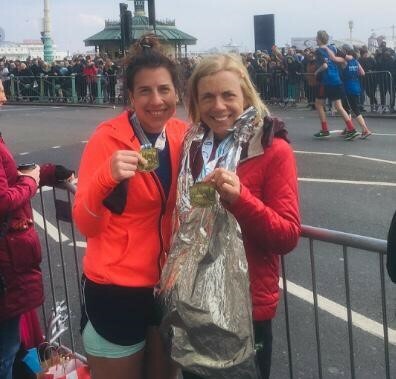 We had just squeezed onto the London train when much to my embarrassment Laura said in a loud voice ‘‘Could anyone give up their seat for my mother who is one of the oldest people to have just completed the marathon!.” I shouldn’t complain, it worked! Rob Downs Well done both! Diane Bygrave Amazing !!! Well done girls!